This study aims to provide an understanding of the changing roles of the state forestry agencies in Viet Nam since 1994 and the process of re-aligning their organizational structures to meet new social demands. The study is based on review of existing literature and policy papers, as well as primary data collected through interviews with relevant agency staff at national and local levels. The analysis focuses on the implications of the establishment in 1995 of the Ministry of Agriculture and Rural Development (MARD) the Department of Agriculture and Rural Development (DARD) and forestry sub-departments and forest protection sub-departments at the provincial level. Decentralization trends in forest management since the early 1990s are also covered. Abbreviations and acronyms are included in Appendix 1. Viet Nam is divided into 59 provinces and five centrally-controlled municipalities, with a population of approximately 84 million and a population density of approximately 255 people per square kilometre. Of the total land area of 33.038 million hectares, 57.6 percent is classified as forest land. Forest cover, however, stands at 36.7 percent of land area — 30.5 percent natural forest and 6.1 percent plantation forest (Forest Protection Department 2005). 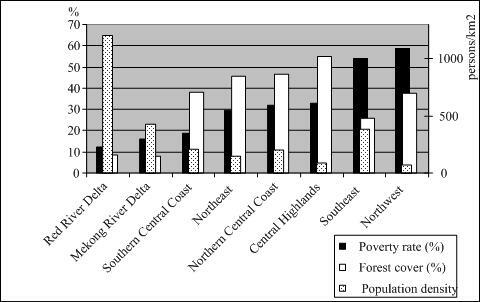 In Viet Nam, as in other countries in the region, there is a correlation between forest cover, population density and incidence of poverty (Table 1 and Figure 1). Sources: www.kiemlam.org.vn; www.gso.gov.vn; World Bank (2005b). Protection forests (48.1 percent of the forested area) for protection of watersheds and land, prevention of soil erosion, desertification and natural calamities and mitigation and adaptation to climate change. Special-use forests (15.6 percent) for biodiversity conservation and reservation of genetic resources, scientific research, protection of historical and cultural heritages and recreational value. Production forests (36.3 percent) for production of commercial timber and non-wood forest products. Source: Forest Protection Department (2004). 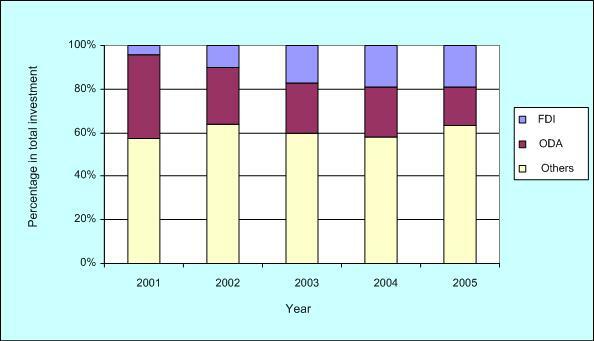 Forest area in Viet Nam has changed significantly in recent decades (Figure 2). Total forest cover dropped from 43.3 percent in 1943 to 33.8 percent in 1976 and 27.8 percent by 1990. In absolute terms, almost 2 million hectares of forest were lost between 1976 and 1990; a net deforestation rate of over 142 000 hectares per year. A turning point came in 1995 when forest area increase exceeded forest loss (mostly due to new plantations), and overall forest cover increased from 28.2 percent in 1995 to 36.7 percent in 2004. Sources: Forest Protection Department (2004); Nguyen et al. (2001). Viet Nam’s current estimated total standing volume is around 813 million m3 of timber and 8.5 billion m3 bamboo and rattan. Most of the timber stock comes from natural forests (approximately 94 percent) with only 6 percent plantation forests. Most of the timber forests are found in three regions: the Central Highlands (33.8 percent of total stock), the North Central region (23 percent) and the South Central region (17.4 percent). State administration in Viet Nam is composed of administrative units operating at the central, provincial, district and communal levels. The National Assembly is at the highest level and is the only body with legislative power. The government is the executive body of the National Assembly and the highest organ of state administration. There are 20 ministries and six organizations with ministry equivalent authority. At the provincial level, the Provincial People’s Council is elected by local people, while the Provincial People’s Committee (PPC) — the executive organ — is composed of members elected from among the Provincial People’s Council. There are similar structures both at the district and communal levels comprising the District People’s Council and Committee (DPC), and the Commune People’s Council and Committee (CPC), respectively. In November 1945, two months after the establishment of the Democratic Republic of Viet Nam, the Ministry of Agriculture and Farming (MAFa) was established. In December 1945, the Forest Bureau (FB) was officially placed under MAFa, with the task of “carrying out administrative and technical activities related to forest and hunting”. In 1946, MAFa issued a decree regulating the FB’s functions focused on seven areas: forest protection, forest use, fee collection, reforestation, hunting, scientific research and training of forestry staff. The decree also outlined the leadership and organizational structure of the forestry sector with five administrative levels from the national to commune levels. In 1946, through Decree No. 508/BCN, the FB was restructured to streamline state forest management into four levels: national, provincial, district and communes. Existing functions were re-organized into management of forests and enforcement of hunting regulations. In 1952, a major change took place with the issuance of two decrees (Decrees No. 01 CV/QT/ND and No. 02 CN/QT/CD of MAFa). The FB was restructured into the Water and Forest Department (WFD). The tasks of the WFD focused on: (1) developing and monitoring implementation of forest policies and production plans; (2) management of state forest enterprises; and (3) exploring forest technologies and implementing forestry development activities. This period was marked by the division of the country into North and South Viet Nam. In the forestry sector, three disparate forestry models were developed: “centrally planned” forestry in the North, “capitalist” forestry in the South and “interim” forestry in the Central Region. In the years following the American War (or Vietnamese War), the northern model was applied widely throughout the country. In the North, the sociopolitical context of the time mandated the forestry sector to fuel the nationalist movement through timber production. In 1955 (one year after the division of the nation), through the issuance of Circular No.6NL/TT, MAFa was expanded into the Ministry of Agriculture and Forestry (MAFo) in recognition of the need for stronger management of the forestry sector. The WFD of the former MAFa was restructured into the Forest Department (FD) with two subsidiary units; one unit following the mandates of the WFD and a new unit responsible for state control of forest use — managing extraction of timber and fuelwood for state needs, by state trading companies or by communities — through improved logging methods that corresponded to principles of forest management. In early 1956, through the issuance of Decree No. 772 TTg, the Forest Exploitation Bureau (FEB) was established under the FD of MAFo. In 1959, distribution and transportation of forest products shifted from the Ministry of Domestic Trade to MAFo. The FD was then assigned by MAFo to take on these responsibilities through three directly operated General Stores for forest products in Hanoi, Hai Phong and Ben Thuy. In April 1960, a major change took place establishing four separate organizations, directly accountable to the Council of Government (CG): the Ministry of Agriculture (MoA), Ministry of State Farms (MSF), General Department of Aquaculture (GDA) and General Department of Forests (GDF). This structural change implied a major change in the forestry sector, reflected in the increased status from a bureau accountable to MAFo to a general department accountable to the CG. GDF’s mandates were to advise the CG on forestry issues including, development of forest legislation, strategies and plans; forest management and commercialization; forest inventories; forest protection and reforestation; forest use, transportation and distribution of forest products; scientific research and training on forestry practices; and ratification and implementation of international treaties in forestry-related fields. To fulfill its mandate, the GDF was equipped with five technical departments that addressed forest plantation, forest inventories and planning, forest resource use, transport and distribution and forest product processing. In 1963, for the first time, a department for forestry protection was established and called the Forest Protection Department (FDP). In 1972, an ordinance was issued that underscored forest protection and the enforcement of concomitant laws. The FPD engaged in forest patrolling, monitoring the implementation of forest protection laws, controlling forest fires and promoting forest protection practices among local populations. To facilitate local implementation, a two-tier forestry administration system was established at the provincial and district levels comprised of the FD, which was responsible for forest management and forest production and the Forest Protection Sub-department (Sub-FPD), which dealt with law enforcement for forest management and protection.3 At the district level, two separate bodies remained responsible for forestry issues: a district Forest Protection Unit (FPU), under the Sub-FPD, and an Agriculture Board, which also addressed forestry issues. In heavily forested districts, the forestry component of the Agriculture Board was combined with the FPU into a Forestry and Forest Protection Unit. During this period which was marked by the unification of Viet Nam in April 1975, the focus of the forestry sector was anchored around timber production for national reconstruction and the development of new economic zones (NEZ), and promoting sedentary farming and fixed upland settlements. A year after the end of the war, three organizations were responsible for forestry across the country: The Hanoi GDF in the North, the Forestry Committee in the Central Region and the Sai Gon GDF in the South. In July 1976, the Ministry of Forestry (MoF) was established to consolidate the directions set out by the three organizations. The establishment of the MoF increased recognition on the role of the forestry sector and its importance, moving from its subordinate role to full inclusion within the CG. At the provincial level, FD offices were established in all provinces to oversee forestry activities. In 1977 through Decision No. 207/CP, the MoF was assigned the implementation of fixed cultivation and sedenterization (FCS), and by Decision 272/CP, the development of NEZs in uplands. These new responsibilities, as well as renewed interest in forest use and development contributed to the development of the State Forest Enterprise (SFE) system, with particular impact in upland provinces. The SFE system soon became a potent production force generating employment for more than 40 000 labourers, and production of timber by SFEs amounting to over 8.1 million m3 between 1976 and 1980 (or more than 1.6 million m3 per year), as compared to 1.1 to 1.3 million m3 per year previously. With the decision of the Sixth National Congress of the Vietnamese Communist Party in December 1985 to shift from a centrally-planned to a market-oriented economy, Viet Nam entered a period of economic reform (Doi Moi). By 1990, the reform policy had had a significant effect on the economy and inflation rates had dropped drastically. Annual GDP growth reached 5.1 percent in 1990 (up from 0.3 percent in 1986). In the agriculture sector, reform was initiated in 1981 and fully consolidated in 1989, by which time, Viet Nam transformed from a rice-importing country to a rice-exporting country; it became the third largest rice exporter in the world by 1990. The period was also a transitional time for the Vietnamese forestry sector. While timber production remained an important feature, it was generally acknowledged within the sector that internal reform was required to keep pace with national development. One of the most important changes in forest management was the MoF’s promulgation of Decision 1171/QD of December 1986 on management regimes of forests according to type: production forests, protection forests and special-use forests. The development of the forestry sector generally lagged behind the rest of the national economic expansion as the sector’s competitiveness was low compared to that of others under the new market economy. For the forestry sector, the rate of return of investment was only 2 percent compared to the national average of 4.8 percent. This was partially attributed to commercial forestry permitted only to SFEs and forestry cooperatives; the private sector was essentially excluded. Moreover, forest production systems faced multiple challenges. Overexploitation of the forest in the previous decade had resulted in serious degradation of forest resources nationwide. Even forests in remote areas were threatened with depletion. Consequently, timber production volumes were significantly reduced. By 1986, around 200 SFEs (more than 40 percent of all the SFEs) in 20 provinces (out of 39 provinces) had no access to productive forests and were further constrained by budget cuts. In addition, there was confusion on permission for commercial activities in forests for many local-level state forest organizations. By 1990, once Doi Moi had put the economy on a new track, the forestry sector was under great pressure to undergo major reforms. Not only were the country’s forests in a perilous state, but forest agencies were also perceived as being too weak to effectively implement state management under the new market economy (Nguyen et al. 2001). Development of NEZ and implementation of FCS included as the FD’s mandates. Between 1989 and 1991, at the request of the MoF, a review of forest development in Viet Nam was undertaken through the Tropical Forestry Action Plan Project.4 Based on the results, the MoF initiated reform in the forestry sector, focusing on four key areas of change which reflected the overall shift from state- to people-centred forestry (Nguyen et al. 2001). A shift from forest use to forest development and generation of forest products. A shift from centralized state management to multistakeholder management, employing social forestry practices. Redirection from timber production to value-added processing. A shift from low-tech forest management and use to high-tech forest intensification. In 1991, the Forest Protection and Development Law (FPDL) was passed to promote a multistakeholder approach to forest management (though the role of the state remained central). According to this new law, forest resources could be allocated to different land users (including organizations and individuals) for protection and commercial production. The law laid out a framework for forest protection and development as well as decentralized forestry functions to people’s committees at different levels. Decentralization of land management was also reflected in the new land law passed in July 1993. The land law entitles land users to long-term renewable land-use titles, or Red Book Certificates (RBC) officially recognizing five rights of the title holder: rights to exchange, to transfer, to inherit, to mortgage and to lease the land-use title. Together, the FPDL and the land law set out the two important future directions for Viet Nam’s forestry sector: state management for forest protection and development, and the involvement of the private sector in commercial production of forest-based products. From 1991 to 1993, in an effort to streamline the SFE system, a requirement was set for all SFEs to be self-financed, thereby liquidating or restructuring all economically unviable SFEs. Nevertheless, the SFE reform was reviewed as incomplete and further restructuring efforts were required. The “327 Programme” which started in 1992 made significant contributions to the participation of local populations in forest management towards a social forestry orientation. The programme started initially with the aim of protecting existing forests in critical areas and rehabilitating degraded lands, later adopting approaches to attempt permanent resettling of ethnic minorities living in and around critical forest areas. 1994 marked a year of restructuring of the forestry sector in Viet Nam. Through Decree No. 8/CP in February 1994, officially the MoF was put in charge of developing and implementing national reforestation programmes and projects. 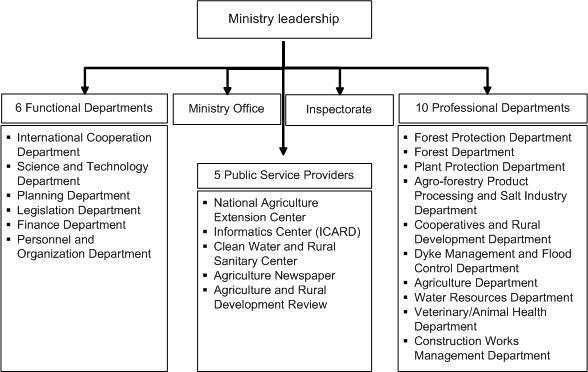 By September 1995 — just before the establishment of the Ministry of Agriculture and Rural Development (MARD) — the MoF had ten departments dealing with: silviculture, forest industries, science and technology, international cooperation, planning and statistics, finance and accounting, organization and labour, forest protection, the Inspectorate and the Ministry’s Office. Two institutes were established directly under MoF: the Forest Science Institute of Vietnam (FSIV) and the Forest Inventory and Planning Institute (FIPI). Other entities under the MoF included national parks and a number of forestry schools. Other restructuring took place at local administration levels to facilitate local implementation. At the provincial level, two state agencies were responsible for forestry issues: the Forest Department and the Forest Protection Sub-Department, the latter being directly accountable to the PPC.5 At the district level, the district FPU was merged with the district Agricultural Board, which provided advisory support to the DPCs. At the commune level, there were three different types of forest management bodies. In some communes, the Commune Forestry Board (CFB) assumed responsibility for commune-level forestry issues, whereas other communes had professional forestry staff, and still others were neither managed by the CFB nor professional forestry staff. The restructuring of the forestry sector in 1994 marked an important change in national forest management. In general, the restructuring process reflected the commitment of the state to engage local populations, while shifting from forest use to sustainable development of forest resources. In 1995, the Ninth National Assembly passed a resolution to set up MARD to streamline and merge the functions and mandates of the MoF, the Ministry of Agriculture and Food Industry and the Ministry of Water Resources. The government issued Decree No. 73/CP specifying the mandate of MARD as the state agency responsible for management of agriculture, forestry, water resources and rural development and MARD thus became the primary authority for forestry in Viet Nam. With the establishment of the new ministry, most of the mandates under the former MoF were placed under the Forest Protection Department (FPD) and the newly established Forest Development Department (FDD), both under MARD. The FDD was established along with a Silviculture Division and a Forest Utilization Division to advise on the establishment, rehabilitation, utilization and development of all three forest types, as well as the development of social forestry. Other departments were also established within MARD to address forestry issues (Figure 3). The Agricultural and Forestry Extension Department (AFED) was assigned to carry out extension activities for both agriculture and forestry. Within the AFED, forestry extension was carried out by the Forestry Extension Division (formerly under the Silvicultural Department). The Department of Agro-forestry Product Processing and Rural Industries (DAFPPRI) prepared plans, development projects, issued permits, legal documents, policies, guidelines and standards related to forest product processing and conservation. The Policy Department formulated forestry policies and legal documents for endorsement. In addition, the following institutes were made directly responsible to MARD: the Forest Science Institute of Vietnam (FSIV); the Agro-forestry Science and Technology Institute of the Central Highlands; the Forest Inventory and Planning Institute (FIPI); the Management Board for Forestry Supported Projects (MBFAP); Vietnam Forest Product Corporation (Vinafor); Vietnam Forestry University (VFU); and the Central Forestry Seed Company. Apart from these institutes, research in forest sciences is also carried out by national parks under MARD, such as Tam Dao National Park and Cuc Phuong National Park. Similarly, at the provincial level, through issuance of Decision No. 852/TTg, the Department of Agriculture and Rural Development (DARD) was set up consolidating relevant sectoral provincial offices to become the primary provincial authority in charge of state forest management. The DARD director was made accountable to the PPC and MARD for activities within his/her terms of reference. DARD comprised of 11 sections and subdepartments to deal with forestry development, FCS, NEZ development as well as the management of a subsidiary Extension Center. The Forestry Section (FS) of DARD was established to oversee forest management, silviculture and implementation of forest plantation projects, with a staff of six to ten officials. In provinces with large forest area, forestry development sub-departments (Sub-FDD) were established in place of the FS. At the district level, the Agriculture and Rural Development Unit (ARDU) incorporated district level authorities for the related sectors. ARDU was directly accountable to the DPC. An Agriculture and Forestry Extension Station was established under ARDU, assuming responsibility for agricultural and forestry extension work. At the commune level, all tasks of the sector were assigned to a single CPC member. In general, the substantial changes in the sector had taken place prior to the establishment of MARD in 1995, and the emergence of the new ministry did not radically change operations for the forestry sector. Source: Based on relevant legal documents. The organizational structure of MARD today remains largely unchanged since its establishment in 1995, including six functional departments and ten professional departments. At the provincial level, DARD (1) advises and assists the PPC on matters pertaining to state management of agriculture, forestry, the salt industry, water resources and rural development; (2) provides public services in the agricultural and rural development sectors; and (3) carries out other tasks as mandated by the PPC. The Sub-FPD supports the PPC in forest protection and management and related law enforcement at the local level. At present, the Sub-FPD operates in 59 provinces, 43 of which are under PPCs and 16 are under DARDs. At the district level, there are 424 district FPUs, 47 Forest Product Control Units (FPCUs) and 67 mobile forest protection teams. In addition to the regular FPUs, there are 45 FPUs under special-use forests (REFAS 2005). At the commune level, forestry tasks are addressed by the CPC, with the assistance of forest rangers from the FPU at the district level. From 1995 to date, the development of Viet Nam has been characterized by strong economic growth and increased global and regional integration, which have translated into changes for the forestry sector as well. The sector has been under pressure to not only improve its productivity and competitiveness in international markets, but also to meet international commitments to sustainable forestry. Furthermore, while there have been notable changes from state forestry to socially integrated forestry, major social challenges remain. Despite a drastic reduction over the last decade in the number of people living below the poverty line, poverty still remains endemic in many upland areas. In recent years, poverty alleviation and sustainable forest management have become central challenges for the forestry sector. In 2001, MARD approved the National Forest Strategy (NFS) for the period 2001 to 2010. The NFS 2001–2010 identifies sustainable forest resource management and forest development as key development directions, reflected also in the commitment towards people-centred forestry. Soon after the approval of the NFS 2001–2010, a memorandum of agreement was signed between the government and international partners for the Forest Sector Support Programme and Partnership (FSSP&P). The NFS proposes strategies in forest administration, technology, human resources and policies to be carried out through six development programme areas: the Five Million Hectare Reforestation Programme (5MHRP); sustainable forest management and development; wood and forest product processing development; forest resource inventory, monitoring and assessment; forest seed development; and human resource development. But the development of the NFS had some major weaknesses. The strategy was not based on a comprehensive analysis of the sector and calculations of both tangible and intangible forest values. The preparation of the strategy did not integrate experiences from outside Viet Nam and future development trends. Moreover, it did not clearly identify financial resources necessary from sources including the government, international donors and the private sector (MARD 2005a). In response, a review of the sector was carried out more recently, and in early 2007, the NFS 2006–2020 was promulgated, which stipulates the direction of national forest development. According to official statistics, the contribution of the forestry sector to the national GDP has been rather low over the last decade (Table 4). Growth in the sector has also been modest at 0.88 percent per annum between 1995 and 2004, as compared to 4.09 percent for the agriculture sector and 8.51 percent for the whole country over the same period. Nevertheless, the figures do not capture the contribution of the sector to the national economy in terms of industrial production or fuelwood production (which contributes 7 percent of national energy demand). The count also fails to value environmental goods and services provided by forests (including carbon sequestration, ecotourism, or biodiversity conservation). Furthermore, arguably, if timber harvested and traded through illegal forest activities (said to be over 50 percent of national roundwood supply) were factored in, the full potential of the sectors’ contribution to the economy would prove far greater (MARD 2005b, p.6). There have been efforts to address the issue of forest valuation in the recently approved Law on Forest Protection and Development. Currently, work is being carried out to prepare methodologies for valuing forest goods and services. In terms of poverty alleviation, Viet Nam has made major progress. Between 1993 and 2004, the national poverty rate dropped from 58.2 to 24.1 percent, implying a reduction of the population living in poverty by more than half in 11 years. Such progress has been generally attributed to strong national economic growth. In the forestry sector, attention to poverty reduction was raised through the 5MHRP and the NFS 2001–2010. Nevertheless, systematic approaches to the challenge have yet to be adopted, as the sector’s direct contribution to poverty reduction is unclear and the impacts of forestry on the poor remain vague (Dinh and Research Group of VFU 2005; Nguyen 2005a). With the government’s approval of the Comprehensive Poverty Reduction and Growth Strategy (CPRGS) in 2002, the forestry sector was challenged to identify specific strategies for meeting the national poverty reduction goal. In the NFS 2006–2020, an attempt was made to include poverty reduction in the forestry sector’s developmental orientation. Preliminary findings from research show that there are various challenges, including provision of legal rights to local people, promotion of different forms of forest management with local community participation, identification and implementation of appropriate reward mechanisms for environmental services, and establishment of an effective forestry extension network (Dinh and Research Group of VFU 2005). These findings suggest that an adjustment in approach will be required by the sector to meaningfully contribute to the poverty alleviation objective. The shift towards people’s forestry has created major challenges for the sector, especially in terms of human resources development. Compared to other disciplines, forestry training institutions in Viet Nam have experienced difficulty in recruiting top students, due the public perception of forestry being a less attractive profession (ETSP 2005). Nevertheless, in reality, the sector provides important career opportunities for students from rural upland areas, and thus diversification of forestry courses is being explored in forestry training institutions. Also, in response to needs for greater investment in training opportunities, especially for students from remote rural areas, the Vietnam Forestry University (VFU) has started offering a special preparatory programme for ethnic minority students. The retraining of existing forestry officials (including field staff) has also proved to be a challenge. Measures taken in response include the provision of short training courses at centralized training centres (in Hanoi and Ho Chi Minh City) as well as in other localities, formulation of task forces assigned to develop new training modules and the establishment of training centres for forest protection staff in forestry high schools. Nevertheless, refresher training opportunities for forestry staff, particularly those at lower levels are seen as inadequate. For example, only 10 percent of forestry managers have received updated managerial training, and in some remote areas, forestry officials have not received updated training at all (MARD 2004a). Training institutes under MARD currently include: (1) five forestry technical training schools for forestry workers; (2) four central forestry high schools and colleges, which offer training in technical forestry; (3) two management schools, which focus on (refresher) training for in-service forestry staff; (4) the Vietnam Forest University for higher forestry education; and (5) The Forest Science Institute of Vietnam offering forestry education to the Ph.D. level. There are more than 20 agriculture and forestry schools and colleges directly under provincial authorities and four agriculture and forestry universities with annual enrolment in forestry programmes of around 800 students (MARD 2004a). Forestry education also includes ongoing part-time education programmes that serve to upgrade the qualifications of forestry officials (ETSP 2005). Non-formal training courses are provided by development projects and other agencies for a wider audience, including project managers, technicians, extension workers and farmers. Opportunities for training in social forestry have also been opened up to include forestry professionals, potential recruits as well as interested people at large. Social forestry training first started in 1994 when a Social Forestry Training Center was set up at the VFU, and by 1997, social forestry officially became an undergraduate major at the VFU and a network of training opportunities was established, including five universities that offered training in forestry. The weaknesses in human resource development in the sector have been acknowledged and taken into consideration in the recent NFS. The new forest strategy proposes enhancement of managerial and technical skills of forestry officials at all levels by overhauling the forestry education and training system, and developing prioritized short training programmes, among other initiatives. Over the last decade, substantial achievements have been made with regard to devolution of forestry decision-making. In December 2004, a new Forest Protection and Development Law was passed, outlining decentralized responsibilities and the transfer of forest protection and development to local levels with emphasis on coordination among the different national bodies. The 1991 Law on Forest Protection and Development and the 1993 Land Law initiated the devolution of forest management to local people. By the end of 2004, almost 3.2 million hectares of forests (accounting for 25.5 percent of the total forest) were being managed by local people, either individually or collectively (Forest Protection Department 2004). Nevertheless, major challenges remain. There are no clear mechanisms for benefit sharing between households and communities managing forests, and the state (Nguyen 2005a). Though various benefit-sharing arrangements are being explored, there is still a gap between stipulations and the capacity for local level implementation. Since the establishment of MARD, forestry and agricultural extension activities have been integrated into one system, recognizing the many cross-sectoral issues in upland rural development. In 2002, by Decree 30/2002/QD/BNN-TCCB, the National Agricultural Extension Center (NAEC) under the Agricultural and Forestry Extension Department (AFED) was established as an extension service provider at the national level and in July 2003 the NAEC became directly responsible to MARD; the AEFD was replaced by the Department of Agriculture. At the provincial level, Province Agricultural Extension Centers (PAECs) have been established under the DARD in all 64 provinces and municipalities. In addition to PAECs, the Provincial Agricultural Extension Advisory Council facilitates coordination among different agencies involved in extension-related activities and support services. At the district level, District Agricultural Extension Stations (DAES) have been established in approximately 80 percent of all districts. There are various organizational models for extension at this level. In some provinces, DAES are directly under PAECs; in other provinces, DAES are directly under the DPC; elsewhere, DAES belong to ARDU. At commune and village levels, the situation varies. Conventional extension programmes at these levels feature extension workers, extension clubs and extension volunteers (ETSP 2005; Hoang and Nguyen 2003). In 2005, with the issuance of Decree 56/2005/ND-CP, extension workers at the commune and village level were made mandatory. Concomitant to the national extension network is the provision of training for extension workers. While curricula on extension training for work with farmers have existed along with university course options, provision of training in specific extension services remains weak. So far most extension efforts have focused on the agriculture sector particularly on the provision of agricultural inputs and training on agricultural production. Between 1993 and 2000 approximately 90 percent of the budget from the central government for extension work was allocated to the agriculture sector. In general, forestry extension activities in the field have been attributable to international donors and NGOs. Over the last decade, various international projects have been engaged in forestry extension approaches in different areas of Viet Nam. Some of the most important lessons come from the Swiss Development Cooperation (SDC) through the SFSP (1994–2002) and the ongoing Extension Training and Support Project (ETSP), implemented by Helvetas Vietnam in collaboration with its local partners. Other projects include the Swedish-funded Mountain Rural Development Programme, the FAO-funded Participatory Watershed Management Project in Quang Ninh Province and the German-funded Social Forestry Development Project. Various international NGOs also carry out projects not only in forestry extension activities, but more importantly provide human resource training for local extension systems. Future plans in forestry extension under MARD look toward the involvement of different stakeholders in the development of the forestry extension networks. Emphasis will be on forest and forest land allocation policies, marketing and technology transfer for sustainable upland cultivation. The main targets will be marginalized groups at the grassroots level (MARD 2003). From the early 1990s to date, the 327 Programme and the 5MHRP have been the two major national programmes implemented by MARD. These programmes have contributed to a number of important areas in the sector, including environmental protection, poverty alleviation, restructuring of the SFE system, decentralization of forest management and rural livelihoods. Programme implementation has also resulted in the reform of some state forest agencies. The 327 Programme (1992–1998) was launched in September 1992, against a backdrop of rapid forest degradation and deforestation. The programme objectives were to rehabilitate existing barren lands within 15 years, and to promote a sedentary life for ethnic minorities living in and around forest areas. The central components of the programme were forest and land allocation. Individual households were entitled to a contracted forest area for protection, restoration and regeneration (on an annual basis) with remuneration of VND50 000 per hectare per year. In 1995, the programme was reviewed to focus attention on protection and special-use forests through plantation, regeneration and agroforestry. Substantial resources were spent on the 327 Programme; in the six years of implementation, total investment capital amounted to VND2 980 billion. Around 1.6 million hectares of protection forest were safeguarded through contractual arrangements, 409 000 hectares of forest were rehabilitated and 543 000 hectares were reforested. The programme had several major implications for state forest agencies, particularly those at the field level. SFEs or FPUs became designated project managers tasked to subcontract forests to local people for protection or plantation, monitoring the implementation of these activities and providing necessary technical support. The 5MHRP (1999–2010) also known as the 661 Programme, was launched in 1997 to increase forest cover from around nine million to 14.3 million hectares (from 28 percent to 43 percent) by 2010. Of the five million hectares to be reforested, two million hectares were targeted as protection forests and three million hectares as production forest. In addition the programme was designed also to contribute to poverty alleviation and increase income for the inhabitants of mountainous areas. Under the 5MHRP, existing production forests and certain protection forests were allocated to individuals and local households on long-term contracts. Furthermore, people who invested in the establishment of production forests were entitled to benefits from this forest. The 5MHRP had greater impact in improving forest cover and forest quality in comparison with the 327 Programme. Between 1999 and mid-2005, approximately two million hectares were reforested and 2.26 million hectares of forest protected under contract. Total investment capital has accumulated to VND5 916 billion or around US$374 million. Recently, most assistance from international donors to the forestry sector has been channeled through the FSSP&P, which was established in 2001 to streamline international assistance for sectoral needs. The partnership framework has been widely supported, which is reflected in the increase of international partners from 19 in 2001 to 24 in 2006. FSSP&P activities are organized through five programmes: (1) the Programme for Sustainable Forest Management; (2) the Programme for Forest Protection, Conservation and Environmental Services; (3) the Programme for Wood and Forest Product Processing and Trade; (4) the Programme for Forest Research, Extension, Training, and Education; and (5) the Programme for Strengthening Forest Sector Policy, Organizational, Planning, Financial, and Monitoring Frameworks. There is also an International Support Group (ISG) under MARD, serving as a forum for discussion by the government and international donors on priorities, policies, strategies and experiences in agricultural and rural development. Currently, there are 15 projects with an estimated total budget for 2006 to 2010 of approximately US$150 million. 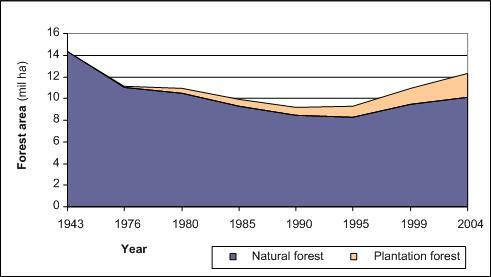 With the decrease in forested area and the imposition of a partial logging ban in 1992, roundwood extraction has declined (at least officially). In 1996, annual logging by state forest organizations was around 0.98 million m3, compared to around 1.1 million m3 in 1991 and 1.4 million m3 in the mid­1980s. Annual logging by state forest organizations continued to fall, with the consolidation of the logging ban in 1997, to around 300 000 m3 in 2000 and 200 000 m3 in 2004. In response to the declining timber harvest, the government is working to implement policy directives aimed at promoting domestic wood processing and export of finished products; shifting of timber production from natural to plantation forests; and importing raw wood materials for domestic use. In addition, MARD strengthened control on logging procedures on both natural and plantation forests. In January 1999 MARD issued a Decision on procedures for harvesting timber and forest products.8According to this Decision, DARD is mandated to appraise and issue logging permits. In collaboration with the Sub-FPD, DARD is also responsible for monitoring logging activities. However, in part as a response to these tightening measures, there has been corresponding increase in illegal logging. According to FPD statistics, the volume of illegal timber harvested declined slightly from 61 012 m3 in 1998 to 56 747 m3 in 2003. However, the trend has since reversed with much larger volumes of illegal harvesting taking place, though largely unrecorded. Estimates suggest that this illegal timber volume could be over 50 percent of the national roundwood supply (MARD 2005b); this poses a serious threat to sustainable forest management. The government’s commitment towards biodiversity conservation is reflected in the following policy directives and programmes: the National Nature Conservation Strategy of Vietnam (1984), the Tropical Forestry Action Plan (1991), the National Plan for Sustainable Environment Development (1991), the Law on Forest Protection and Development (1991, 2004) and the Law on Environment Protection (1993, 2005) (MARD 2005b). Forests designated for conservation in Viet Nam fall into the category of special-use forests. Over the last decade, the forestry sector has made substantial efforts to identify and expand special-use forest areas and strengthen its management capacity. By the time of MARD’s establishment in 1995, there were 90 special-use forests covering an area of 953 000 hectares. At present, there are 26 national parks, 66 natural reserves and 37 historical, environmental and cultural forests nationwide, covering approximately two million hectares. Of these special-use forests, there are eight national parks under direct MARD management, with the remainder under management by PPCs. In the forest industry, there are various units; around 319 SFEs (including the largest, Vinafor), the Central Forest Seed Company and its local affiliations and more than 250 wood and forest product processing enterprises under provincial authorities. In addition, there are approximately 40 enterprises with foreign investment and 786 enterprises in other economic sectors that also are involved in the forest industry (MARD 2003). State-owned enterprises manage expansive forest areas. For example, SFEs manage approximately five million hectares of natural forest or 50.7 percent of the total natural forest area (Nguyen 2005a). To increase the independence of state enterprises in business operations, the government has transferred the control of most state enterprises from MARD to local authorities, and is promoting reduced government control on these enterprises (MARD 2003). Over the last decade, the forestry sector has gained increased recognition as a sector of national importance, reflected through government funding, policy-making and legislation. Under the current legal framework, the most important document guiding forestry development is the Law on Forest Protection and Development (2004). The government has also issued various by-laws including three legal documents issued between 1999 and 2004 for the implementation of SFE reforms. As demonstrated through the government’s shift to adopt poverty alleviation goals in its key sector strategies, as well as its recognition of multistakeholders and devolution of authority, the sector has been relatively quick to adjust to emerging issues. These factors have contributed significantly to the effectiveness of sector reforms. Early support to the sector came from the Swedish International Development Agency (SIDA), the German Agency for Technical Cooperation (GTZ), the German Bank for Reconstruction (KfW), the Japanese International Cooperation Agency (JICA), the World Bank, FAO, the World Food Programme (WFP) and other international donors. International investment is continuing to grow and in recent years, investment from the private sector has become substantial. Since 2001, most international assistance has been channeled through the FSSP&P for better targeting of forestry objectives. Between 2001 and 2005, Overseas Development Assistance (ODA) and Foreign Direct Investment (FDI) in the forestry sector accumulated to over VND6.5 billion (over US$400 million), accounting for around 40 percent of the total investment in the forestry sector (Figure 2). In 2004, a Trust Fund for Forest (TFF) was established with funding from four international donors — the embassies of the Netherlands, Sweden, Switzerland and Finland — with an initial contribution of over €15 million. For the period 2004–2007, the four donors pledged contributions of approximately €9.53 million. This funding will be managed by FSSP-CO. The TFF concept is to provide support for pro-poor and sustainable approaches to forest management. By pooling funds from the four donors, the TFF expects to provide more effective support to key priorities in the forestry sector as stipulated in the FSSP&P agreement (FSSP-CO 2005). The international community has also provided technical support. Internationally funded projects have helped in the transfer of state-of-the-art technology and experiences from other countries as well as human resource training for the sector. Viet Nam is currently signatory to around 28 multilateral environmental agreements (MARD 2005b): i.e. the Convention on Biological Diversity (CBD), Convention on International Trade in Endangered Species (CITES), United Nations Convention to Combat Desertification (UNCCD) and the UN Framework Convention on Climate Change (UNFCCC). In addition, Viet Nam is a member of a number of international organizations that promote sustainable forest management, such as the Asia Forest Partnership (AFP), Asia-Pacific Forestry Commission (APFC), International Network on Bamboo and Rattan (INBAR), Center for International Forestry Research (CIFOR) and the Regional Community Forestry Training Centre (RECOFTC) (MARD 2005b). It is also expected to become a member of the International Tropical Timber Organization (ITTO) in the future. Substantial financial assistance from the international community to the forestry sector is not, however, expected to continue for long. Viet Nam is moving towards joining the medium-income group of countries, and grant assistance and credits are expected to shift to loans at less concessional rates. Alternative financing resources will therefore need to be found. Though the government has been quick in identifying emerging issues and adopting overall strategies to address them, there remain gaps in the sector’s legal framework which hinder sound implementation. First, many legal documents lack clarity and practicality. For example, Decision 178/2001/QD-TTg, which stipulates entitlements and obligations of forest owners, comes with benefit calculation methods which are too complicated to be applied in practice. This has resulted in its slow implementation, even four years after its promulgation. Second, there are legal inconsistencies. For example, local communities are legally recognized as forest owners under the 2004 Law on Forest Protection and Development. However they are not recognized as legal entities under the Civil Code and are consequently not able to enjoy full ownership rights. Another example is related to the role of the PPC. According to Resolution 08, the PPC is stipulated as being responsible for provincial plan development while in Article 18 of the Law on Forest Protection and Development, PPCs are accountable for only developing plans while MARD is stipulated as the authority for appraisal (REFAS 2005). Third, legal documents are often issued without taking into account the practicality of implementation; often financial and human resources are not available to fulfill tasks as stipulated. There are many cases where legal documents are issued by the central government leaving local authorities responsible for identifying and securing the resources needed for implementation. The lack of clear indicators and a proper system for monitoring implementation also contributes to slow policy implementation and poor feedback of results. Another weakness lies in government’s capacity to implement and monitor legal frameworks. At the central level, the number of staff in the FD and FPD has remained at approximately 44 to 48 people in each agency over the last ten years. At the provincial level, there are currently around 530 staff working in the Sub-FD or FS under DARD, ranging from five to 20 people per province, and around 1 300 FPD officials in the Sub-FPD. At the district and commune levels, there are no more than two forestry staff working in each ARDU and around 8 000 rangers. Poor implementing capacity is also reflected in forestry extension services at the field level. Current extension focuses mostly on agriculture. As the number of people involved in forest management is increasing along with the area of forests, there is an increasing need for extension services supporting forest production and development. Unclear institutional arrangements also negatively affect the overall performance of the sector. For example, Decision No. 1/CP/1996 stipulates that forest planning is the task of the FIPI. In addition, the FIPI is also in charge of carrying out an inventory of forest resources in the country every five years. Conversely, under Directive No. 32/2000/CT/BNN-KL and Decision No. 78/2002/QD­BNN, annual monitoring of changes in forest resources is the responsibility of the FPD. The FPD is also in charge of developing a relational database management system for forest monitoring. Despite the thematically close mandates of the two agencies, there is little, if any, systematic exchange of data or knowledge amongst the two. This leads to duplications of similar activities, with high associated costs. As for forestry policy research and analysis, despite the various institutes and universities involved in research work, there is no single unit responsible for policy research and strategic planning. Existing research institutions mainly focus on research in technical matters, e.g. silviculture, genetic development, product processing and forest species. The FSIV, which is currently the leading research institute in the forestry sector, conducts most of its research work on forest sciences with very little attention to forest policies. Similar to the FSIV, other institutes in the forestry sector also focus on scientific forestry research. In general, there is inadequate policy research and analysis conducted on a regular basis to provide continuous feedback on the impacts of forest policies and to predict future trends. Without such information, the quality of resulting forestry policies, legislation and development strategies for the sector will be hindered. Participation of local people in forest management: Decentralizing forest rights from state organizations to multiple stakeholders, particularly local people who live in and around the forest has been an important part of the fight against forest degradation. Viet Nam is currently allowing different forms of forest management by local people to increase forest cover and improve the livelihoods of local inhabitants. Poverty alleviation as part of the sustainable forestry agenda: With almost one-third of the country’s population living in forest areas, many of whom are considered poor, measures for poverty reduction are important for sustainable forest management. Sound and feasible legal framework: Rapid changes in the sector’s policies have often resulted in confusion in implementation, undermining the overall relevance of the policies. Confusion is heightened when policies are issued without taking into account implementation feasibility and well-defined procedures. Policy research and feedback in strategic decision-making: Weak institutions for policy monitoring and lack of institutionalized policy research and analysis has resulted in weak monitoring of forest policy implementation. Without such information, the feasibility of developing appropriate policies, particularly for long-term development, is limited. Coordination in international assistance: Strong support from international donors has contributed significantly to the sector’s development. With the establishment of the FSSP&P and the ISG, the sector has taken an important step towards more effective coordination of international assistance. Shifting focus from timber extraction to value-added processing: In response to the drastic decrease in coverage and degradation of natural forests, the sector has made a conscious shift from extraction-focused industries to processing for value addition. This shift has not only reduced the pressure on forests but has served to increase the unit value of traded forest products. Preparation for the phasing out of international assistance: Necessary preparations include the development of priority programmes and actions to be undertaken and harnessing existing international assistance to achieve them. Recommended priority areas include capacity building of government staff at all levels through on-the-job training, institutionalizing and operationalizing a policy assessment and monitoring system and strengthening policy-making procedures. Establishment of an agency responsible for policy research, analysis and strategic planning: An agency directly accountable to MARD should be tasked to provide policy-makers with information on policy implementation at the local level as well as broad-based analysis for future development of the sector. Specific tasks of this agency would include conducting regular studies on the effects of various policies, reviewing relevant forestry experiences from other relevant countries, synthesizing lessons from Viet Nam, assisting the FD and the legal department in MARD to develop forest policies and legislation and preparing and revising forest development strategies. Accelerate the process of devolution in forest management: This includes accelerating and extending SFE reforms to the local level as well as enhancing the participation of local people in forest management to improve forest cover and livelihood opportunities. To facilitate this, it is recommended to develop and institutionalize clear and simple procedures to guide the implementation of forest devolution in the field and more importantly to monitor forest management after devolution. Improved institutional arrangement and coordination among different forest agencies: A recommended approach, also suggested by REFAS (2005), is to combine the FD and FPD systems into one unit. The advantage of combining the two systems is the benefit of a unified body at the local level, thus relieving problems of coordination and also reducing administrative staff. Another option to improve coordination is to place the Sub-FPD at the provincial level under DARD, and the FPU at the district level under ARDU or the Economic Unit. Some forest protection staff could then be mobilized in the extension network. Strengthening and institutionalizing the policy monitoring system: This includes developing a set of monitoring indicators with legal adjuncts, consolidating indicators and reporting to relevant authorities regularly. Improve capacity in forestry extension services: With around three million hectares of forests currently under the management of local people and another one million hectares forthcoming (as result of SFE reform), the demand for forest extension services will increase significantly. It is recommended that some FPD staff, particularly those at the local level, should be mobilized to work in the extension network, given their silvicultural expertise and experiences in forest management. As an organizational measure, forest users and managers could be organized into groups at the village or commune level to better access extension services. Dinh, D.T. & Research Group of Vietnam Forestry University. 2005. Report for field consultation research on forestry, poverty reduction and rural livelihoods in Vietnam. Extension and Training Support Project (ETSP). 2005. Forestry Research, Education, Training and Extension (RETE): situation analysis, needs assessment and recommendations for the National Forestry Strategy 2006 to 2020. Hanoi, Viet Nam. Forest Protection Department. 2004. Forest cover data. 2004. FSSP-CO. 2005. Forest Sector Support Programme and partnership: Annual report 2005. Ministry of Agriculture and Rural Development (MARD). 2003. Forestry development orientation. Vietnam Forestry Sector Manual. Hanoi, MARD. MARD. 2004a. Administration and institution of forestry sector. Vietnam Forestry Sector Manual. Hanoi, MARD. MARD. 2004b. Afforestation and reforestion. Hanoi, MARD. MARD. 2005a. Draft National Forest Strategy 2006–2020. MARD. 2005b. National report to the fifth session of the United Nations Forum on Forests: Vietnam. Nguyen, D.V., To, M.D., Ha, C.C., Trinh, H.D. & Nguyen, K.H. 2001. Lam Nghiep Viet Nam 1945–2000 (Vietnamese Forestry 1945–2000). Hanoi, Viet Nam, Agricultural Publishing House. Nguyen, T.Q. 2005a. Trends in forest ownership, forest resources tenure and institutional arrangements: are they contributing to better forest management and poverty reduction? The case of Vietnam. Nguyen, T.D. 2005b. Gioi Thieu Ve Du An Trong Moi Nam Trieu Ha Rung (introduction about the Five Million Hectare Reforestation Programme). Hanoi. Reform of Forestry Administration System (REFAS). 2005. 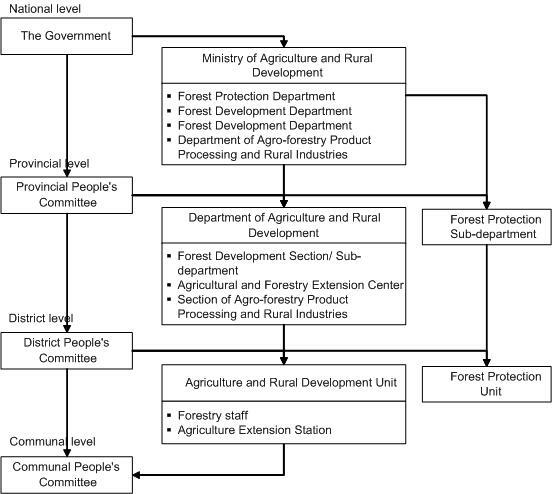 Analysis of forest administration systems — recommendations for reform in Vietnam. World Bank. 2005a. State forest enterprise reform in Vietnam: review of policy and implementation framework for Decree 2000. EASRD Rural Development and Natural Resources East Asia and Pacific Region. World Bank. 2005b. Taking stock: an update on Vietnam’s economic developments and reforms by the World Bank in Vietnam. Hanoi, Viet Nam. 1 Independent researcher. Email: tananh@hn.vnn.vn. 2 This period was marked by several milestones in national history: the foundation of the Democratic Republic of Viet Nam in September 1945; the division of Viet Nam into the North and South in October 1954; the unification of Viet Nam in April 1975; and the launch of the economic renovation policy (Doi Moi) in December 1985. 3 See also GoV Decree No. 101/CP dated 21 May 1973. 4 Project No.VIE/88/037, co-financed by UNDP, FAO and SIDA. 5 In some provinces, the FD was combined with the Department of Agriculture into the Agriculture and Forest Department (AFD). 6 In many districts, ARDU has joined with other production units into an Economic Unit under the DPC. 7 According to Decision 02/1999/QD-BNN-PTLN (1999) by MARD the decision on extraction of timber from natural forests by organizations is to be made by the MARD minister. The logging permit is granted by the PPC based on the MARD decision. 9 Not reflective of inflation rates. 10 This amount includes foreign loans.